In 2008, the financial crisis took hold in Europe with economic problems affecting local real estate markets: investment volume shrank with property prices falling 20–40 %. 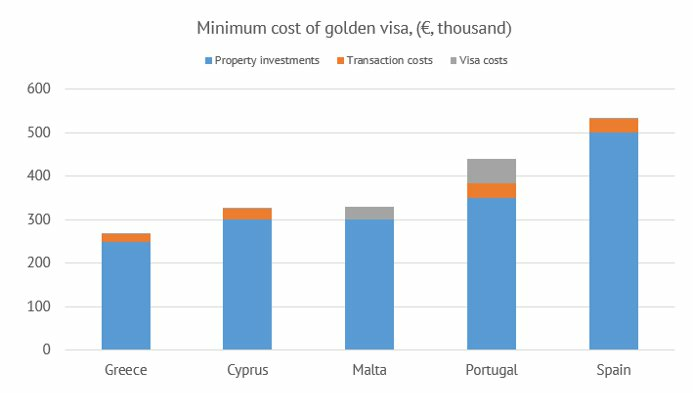 Certain Southern European countries launched ‘Golden Visa’ programmes to stimulate capital inflow from abroad: Greece, Spain, Cyprus and Portugal started issuing residence permits to foreign nationals investing in their economies. Malta, implementing such a programme since 1988, made the investment terms more flexible. Investment vehicles for ‘golden visas’ generally include one or more of the following options — property, business, state bonds, bank deposits or funds — apartments and houses remain the most popular capital investment vehicles. The fruits of the programmes can already be seen: thousands of foreign nationals have used the opportunity to obtain residence by investing billions of euros in participating countries’ real estate markets. Foreign buyer interest has encouraged the prices per square metre to grow. Golden Visa programmes enable any foreign national above 18 to become resident in a host country. The procedure is relatively straightforward and short in comparison to other ways of obtaining residency (via marriage, employment or family reunification). The authorities do not require applicants to be fluent in the host’s national language or even know the country’s history, and document checks take from a couple of weeks to several months. All Southern European residence-for-investment programmes include property investment as an option. In Spain, the minimum property price is €500,000; in Portugal, the property must be at least €350,000 (if over 30 years or located in an area of urban renovation). Malta requires an investment in both bonds and real estate: €250,000 has to be invested in securities and a minimum of €50,000 has to be spent on property rent over five years (for property purchase the amount increases to €270,000, putting total investment at €520,000). Cyprus offers residence to investors buying property worth at least €300,000 and depositing €30,000 in a local bank account. Greece offers the cheapest programme: Greek residency can be obtained with a property investment of just €250,000. the purchased property can be leased out; thanks to the popularity of this region among tourists such real estate can yield 5–7 % per annum. Investors choosing to live in the host country can apply for citizenship after a certain period. Cyprus offers an easier path to citizenship with a Cypriot passport being issued after several months upon buying property of at least €2 million. However, residence-for-investment programmes can become a tax loophole. As stated in a report by the Organisation for Economic Co-operation and Development (OECD), the absence of tax residency control under the programmes leads to violations in data reporting under the Common Reporting Standard (CRS) which obliges all EU member countries to send data related to non-resident bank accounts to the local tax authorities. The OECD report highlights two hypothetical violations. A resident of Country A may buy property in Country B for €500,000, obtain a residence permit and change tax residency without paying tax on the income received outside this country. Then the resident opens a bank account in Country C. All countries of residency need to be specified for tax purposes when opening a bank account, but the resident specifies only Country B. As a result, the bank of Country C will not detect the individual being linked to Country A and not exchange financial data with this country. An investor may obtain an investment-based residence permit and provide utility bills for the property purchased under the Golden Visa programme when opening a local bank account. The bank assumes that the investor is a tax resident of this country and does not exchange data related to the bank account with an external bank in a country where the investor is actually a tax resident. According to OECD experts, the programmes that do not impose strict requirements on the investor’s physical presence in their countries pose the highest risk of violating the CRS MCAA principles. This applies to all Southern European programmes and investors consider it an advantage. Greece, Spain and Malta do not regulate the investor’s stay within their territories at all, Cyprus requires one visit every two years, and in Portugal, as little as one week must be spent during the first year and two weeks during each of the next two years. 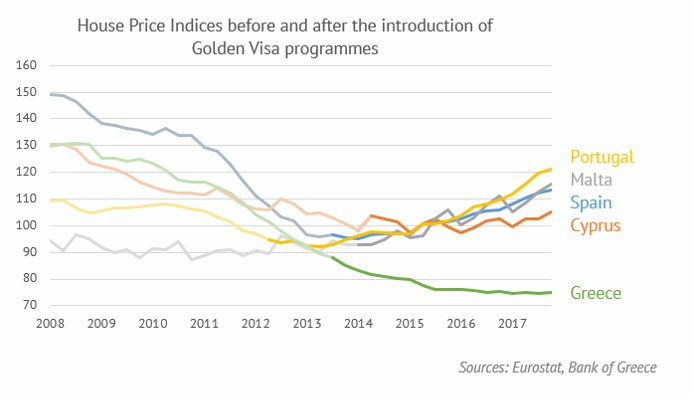 Another risk factor is the refusal to participate in the CRS, but all the Southern European countries offering Golden Visa programmes are taking part in the exchange. To prevent such violations in the future, the OECD is insisting on more thorough documentary proof of the investor’s physical presence in a certain country and instruction to applicants on the necessity to specify all jurisdictions of tax residency at the time of opening an account with foreign banks. These suggestions currently remain abstract, but there is a possibility that Golden Visa programme requirements will be toughened to comply with the OECD demands. Cyprus has already announced limiting the annual number of investment-based passports to 700 after being accused of granting citizenship to those charged with corruption in their home countries.